If you’ve ever wondered what our guests experience while visiting Long Caye in Belize, this 35 min. video, shot by one of our guests and posted on Youtube last October, is a true, full immersion experience. The clarity of the photography is amazing, especially the close-ups of the reef and associated marine life through the crystal clear water. 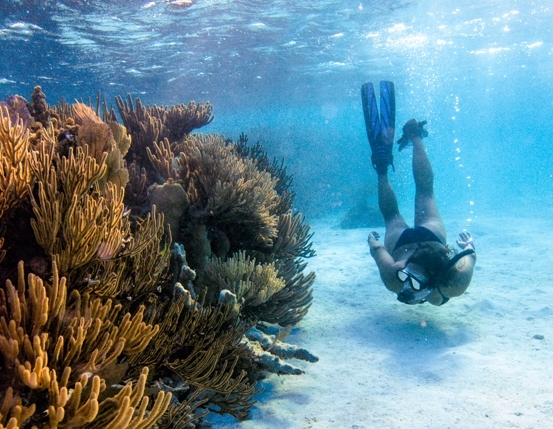 When looking for a snorkeling vacation and the best place to snorkel in Belize, be sure you can snorkel from shore. The great thing about snorkeling is it’s so free feeling. No watching your watch or your depth gauge like in scuba diving, you just swim wherever the spirit moves you. It is much better to just wade in and swim away than have to need to join a big group in a motor boat. The big islands in Belize don’t have snorkeling offshore. Not only are they a half-a-mile from the coral, but there is so much boat traffic, it isn’t safe. You can snorkel from shore at all of the atolls in Belize: Lighthouse, Turneffe, Glover’s Reef. And there are a few small islands on the Barrier Reef also: Tobacco Caye, Southwater Caye, and Ranguana Caye. Snorkeling is a big part of all adventure vacations we offer in Belize on Long Caye on Glover’s Reef (for our money, the best place to snorkel in Belize). Of course every trip varies, but sometimes we snorkel every day for 1-2 hours per session. We have a lot of good snorkel spots right by the island. Using Google Earth, I have marked some of them on the image below. We both swim to nearby snorkel spots, and we also use our kayaks to access even more areas. In the photo below, 10 spots that we explore regularly are shown and listed here. Glover’s is the best place to snorkel in Belize! Want some free information on Snorkeling in Belize? Just submit this brief form. 1. Practice Reef. 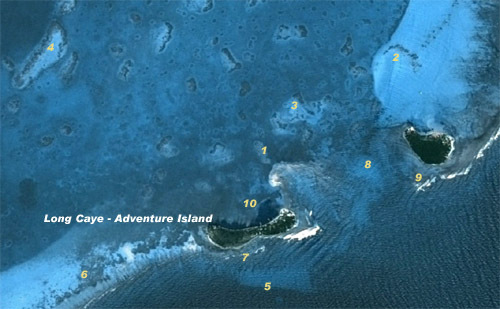 This is where we conduct our snorkel orientations and where we also go night snorkeling. Our most accessible reef, you can walk or swim to it, and much of this patch is only about 3 feet deep, so you can stand up whenever you wish. 2. The Aquarium. Just a 1/2 mile paddle away, this is our favorite snorkel. You can stand up everywhere at this reef. Most of the incredible snorkel images on this site are taken here. 3. Dado’s Reef. This reef is just a swim away. It is quite deep in places. One of the most beautiful snorkel spots you will ever see. 5. The Wall. When the conditions are right we swim to this famous Belize dive site. This entire snorkel is over your head, and conditions have to be calm. Here we can see huge loggerhead turtles swimming right in front of us! 6. The Cut. Here we swim from the southern end of the island along the barrier reef of the atoll from the inside. We cut through the boat channel, and return on the outside of the reef. 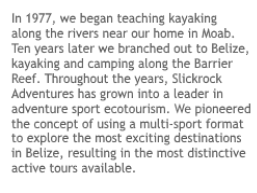 A fantastic, long exploratory snorkel. 7. Snorkel Around the Island. We often swim almost all the way around, and the outside of the island is the best. We are not as far out as The Wall snorkel, the coral and parrot fish here are amazing! 8. The Channel. We paddle out to a deep patch reef between Long and Northeast Cayes. Huge schools of fish, black grouper and spotted eagle rays are seen almost every time! 9. Northeast Caye. There are several areas of reef over near this caye that we like to paddle to. A fairly deep snorkel, it’s nice to have your boat to hang on to if you need extra flotation. This is a gorgeous area. 10. Drift Snorkel. We swim out from the north end of our island, and then drift with the prevailing winds which takes us by three small patch reefs. Then we swim back in at the south end. A very aerobic swim!